Easter is probably the single most particular holiday that shouts rosé! It’s around this holiday that producers and wineries typically release their current vintages. Easter brunch is abundant with foods and tastes that signify the start of spring. From sweet to savory dishes, rosé is a very versatile and best pairing to assist bridge the spectrum in tastes. As the appeal of rosé has risen and developed many winemakers are beginning to effectively experiment with and produce more wines. Below are some of my favorites. Favorite choices with ham are Riesling and Gewürztraminer, and the Finger Lakes is blessed to have access to these wines. Bring a couple of bottles to enjoy and for my friends who drink whatever you’re drinking. For people who drink only reds, look for Cabernet Franc, which has hints of smoke, chocolate and raspberry in the smooth, rich finish. Also consider dry rosé, which will appeal to the super wine-geeks around the table. Finally, you can never go wrong with bubbly, and at Miles we have Cache, which is always festive and goes with a variety of foods, including macaroni and cheese and ham. 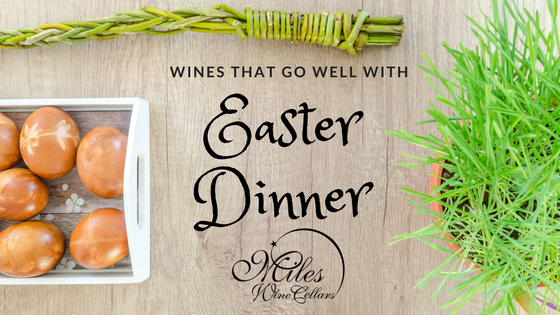 Call or stop by so we can help you choose your wine for Easter dinner. We look forward to hearing from you.